Maximize your packaging throughput and efficiency with the Wulftec WCRT-200 stretch wrapper. 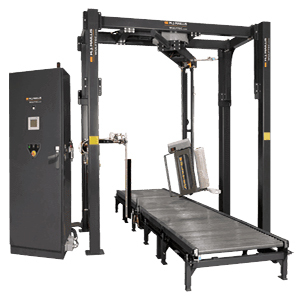 This conveyorized, rotary pallet wrap machine features a 25-inch ring gear with pinion gear drive – the strongest in the industry. And with a heavy-duty steel construction and three-year unlimited cycle warranty, this machine is built to withstand your toughest applications. Wrapping up to 100 loads per hour, it’s no wonder the WCRT-200 is one of our most popular conveyorized stretch wrap models. It not only delivers on safety and efficiency; the durable design prevents load shifting for sturdier end-of-line products. To learn more about the Wulftec WCRT-200 Conveyorized Automatic Rotary Arm Stretch Wrapper, give us a call at (609) 337-3641 or request a quote online. The factory certified technicians at Hughes Enterprises offer on-site maintenance and support – whenever you need them. So, no matter when downtime strikes, you know who to call to get your operations back up and running. Contact us today to discuss your needs with a member of our team.